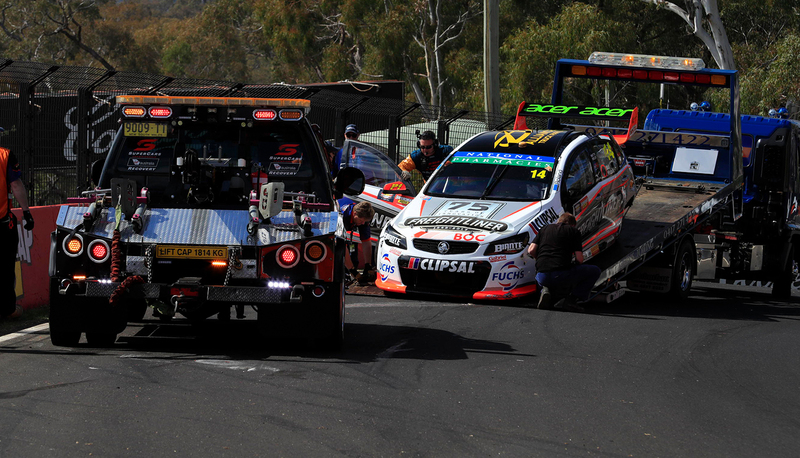 Tim Slade will sit out the remainder of today’s practice at the Supercheap Auto Bathurst 1000 after his heavy crash in the weekend’s opening session. The Freightliner Holden crashed in The Esses halfway through the first hour of running after Slade lost control through the series of downhill bends. Team owner Brad Jones has told Supercars.com that the damage is repairable at the circuit, but will not be completed until tomorrow at the earliest. BJR’s two fabricators have been summoned from the squad’s Albury workshop, having initially stayed behind rebuilding its spares inventory after the hurried build of a new CoolDrive car following Sandown. They are expected to arrive in Bathurst late this afternoon ahead of an all-night repair effort. “It’s looking a little worse every time we pull another piece off it,” Jones told Supercars.com. “That said, we’ve got a couple of fabricators loading up the ute at work and will be on their way here. “We didn’t bring our fabricator up early with us this year because we’re busy replacing parts that have already been bent. “We’ll wait and see how it goes tonight, but if it all straightens up okay, the intention is that we’ll have it fixed for tomorrow. “I don’t think there’s any doubt we’ll have it going for the race, but there’s a fair bit of work to be done, and a bit of damage. It will certainly be an all-nighter." Jones says the team is still in the process of pulling the car apart to understand the full extent of the damage. “Where it’s gone in it’s damaged the rail a little bit at the top on the rear,” he said. “And it’s damaged the bird cage, which holds the transaxle in, and it’s given the transaxle a decent smack. “The transaxle needs to be exactly where it needs to be, so we need to spend some time getting that into place. “We’re pulling the cross member and engine out of it now, to see if the left-front rail has been tweaked. “Ideally we’d leave it in the car and just move it around with the Porta Power to get it where we want it, and then weld it up. Co-driver Ash Walsh will turn laps in the sister entry of Nick Percat/Macauley Jones during the upcoming practice session. The move will allow Walsh to assess his ability to race this weekend after sustaining injuries in a heavy testing crash last Thursday. Work meanwhile continues at Lucas Dumbrell Motorsport to repair the #62 Holden that Alex Rullo crashed at Forrest's Elbow in the opening session. "It was a pretty low-speed hit but unfortunately it is still concrete that he hit, so it was pretty destructive, but there's no chassis damage," explained co-driver Alex Davison. "They're replacing the whole right-front corner. There's no question as to whether it can be repaired, it's just about how long it'll take, making sure it's safe and set-up nice and square. "It's not ideal because you want to go out and build your pace up, but these things happen at Bathurst. It can bite anyone, whether you're experienced like Tim or a rookie like Alex."